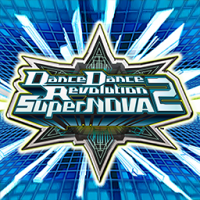 DanceDanceRevolution SuperNOVA2, under the title Dancing Stage SuperNOVA2, was planned for release in Europe. However, due to Sony's policy of exporting the original PlayStation 2 into European territories, the arcade game was cancelled. A new scoring system is introduced, replacing the old one. Marvelous timing is also now on all the time. Due to this, the player has to get a score of at least 990,000 now to obtain a AAA in a song. First mainline DanceDanceRevolution arcade game with no new Dancemania licenses. Many of the timing issues that plagued the original SuperNOVA have been fixed up. First DanceDanceRevolution game to show icon for Premium Mode (JOINT or DOUBLE only) on upper right hand corner of title screen. Character selection screen returns, shown after you have chosen either Single or Double mode. Dancers now have facial animations, and two dancers can once more appear in VERSUS play. Cut-ins are introduced, where a picture of the selected dancer appears after a set number of combos. The Easy/Medium/Difficult/All Music modes from SuperNOVA have been combined into one mode called Standard Mode. Song title and artist information is now listed in-game when playing. e-AMUSEMENT support for DanceDanceRevolution SuperNOVA2 was planned for North America , but ultimately was only available during the location test on Brunswick Zone in Naperville, Illinois. During VERSUS play, if one player's life gauge becomes empty, it will no longer refill and the score will no longer increment. New speed modifiers introduced: x0.25 and x0.5. Modifiers BRAKE and WAVE are now selectable along with BOOST. First DanceDanceRevolution title to have an intro movie since DanceDanceRevolution 4thMIX. First DanceDanceRevolution game to allow unlock codes using 8 panels and selection buttons. This was used until DanceDanceRevolution X2. First DanceDanceRevolution game to run countdown timer without delay when selecting from a set of songs. The timer now displays countdown until 00. First DanceDanceRevolution game to show the PERFECT FULL COMBO message on stage results. First DanceDanceRevolution game where the player can set options on EXTRA STAGE. First DanceDanceRevolution main arcade game to have SPECIAL ARROW types. This option is unlockable via ENJOY LEVEL, or using codes for North American machines. Only DanceDanceRevolution game to show a DANGER message on the battery gauge. Only DanceDanceRevolution game that allows sorting the song list by artist. Last DanceDanceRevolution game wherein a player cannot set options (uses all default instead) on ENCORE EXTRA STAGE or in CHALLENGE mode. Last DanceDanceRevolution game to feature the announcer from DDRMAX. Yellow for new licensed songs, along with special artist collaboration songs. Green for new default Konami original songs (including BEMANI crossovers). Orange for unlocked BEMANI crossover songs. Purple for unlocked Konami originals that are a part of the planet-themed "GRAND CROSS" song series. Pink for unlocked "GROOVE RADAR" challenge-only songs. Red for EXTRA STAGE and ENCORE EXTRA STAGE songs. When fully unlocked, these songs will appear green on the songwheel. Blue for old songs that made their debut on DDR SuperNOVA. White for old songs that made their debut prior to DDR SuperNOVA. Full credits: DanceDanceRevolution SuperNOVA2 credits. The "GROOVE RADAR" Special songs are a set of six unlockable songs using the new e-AMUSEMENT members only feature, My GROOVE RADAR (Myグルーヴレーダー). They are all previously released songs by Naoki Maeda from DanceDanceRevolution 2ndMIX, 3rdMIX, 4thMIX, and DDRMAX2 with new CHALLENGE charts. Due to some of them having already CHALLENGE charts, these new special CHALLENGE charts were added individually in the SuperNOVA2 folder under their "GROOVE RADAR" Special related subtitles instead, with no other difficulty. The first five songs are each associated to one of the GROOVE RADAR five parameters: STREAM, CHAOS, FREEZE, AIR and VOLTAGE. When a parameter reaches 100, the corresponding song is unlocked. In order to raise each parameter to 100, the player have to play songs that contain a high value of that parameter. In the case of DEAD END, it requires to have filled all of the five parameters to 100 in order to unlock it. On April 10th, 2008, the unlock period expired and these songs have been unlocked for normal play for everyone. ZUKIN WARS was a monthly event exclusive to e-AMUSEMENT members. In it you're assigned to one of three teams - Red, Yellow, and Green. Before the Final Stage, you will receive a message with specific instructions. Complete the mission, and you'll defeat what the game calls "Dark Dancers". Defeat a certain amount will unlock a new song. Anyone on that team will also receive that song. 1. "Invasion of The Dark Dancers!" The prize is unlocked for normal play to the members of the Green Team and the players that defeated more than 840 Dark Dancers. The prize was unlocked to the members of the Yellow Team on 10/11/2007, and for everyone on 10/18/2007. 2. "The Dark Dancers: The Second Coming"
The prize is unlocked for normal play to the members of the Yellow Team and the players that defeated more than 380 Dark Dancers. The prize was unlocked to the members of the Green Team on 11/22/2007, and for everyone on 11/29/2007. 3. "Counterattack From Dark Dancers!" The prize is unlocked for normal play to the members of the Green Team and the players that defeated more than 320 Dark Dancers. The prize was unlocked to the members of the Red Team on 1/3/2008, and for everyone on 1/10/2008. 4. "The Dark Dancers: The Final Battle!" The prize is unlocked for normal play to the members of the Yellow Team and the players that defeated more than 330 Dark Dancers. The prize was unlocked to the members of the Green Team on 2/14/2008, and for everyone on 2/21/2008. In SuperNOVA2, the requirements for the EXTRA STAGE changed and the ONE MORE EXTRA STAGE was renamed EXTRA ENCORE STAGE. At first, the player had to get A on the 1st or 2nd STAGE to unlock hidden song(s) for the FINAL STAGE. Getting an A allow the player to unlock the easiest difficulty played while a AA unlocks all difficulty levels. Getting a AA or higher on Unreal, or the FINAL song on Random, earns the player the EXTRA STAGE - NGO (for example). Getting a AA on NGO unlocks TRIP MACHINE PhoeniX as the ENCORE EXTRA STAGE. At the launch of the game, these 3 songs were selected to be part of the system to get to the EXTRA and ENCORE EXTRA STAGE. As time went on, new songs were added via e-AMUSEMENT as ENCORE EXTRA STAGE at first. Following the time schedule below, the songs were moved gradually from being ENCORE EXTRA STAGE songs to the EXTRA STAGE, then to the FINAL STAGE before being completely unlocked for everyone on normal play.